Rosacea is referred to as a skin containing a pinkish tone like a rose. Rosacea is basically a chronic skin disease in which the skin has red spots on the face, small pustules, nose, cheeks, forehead and chin. In this condition, the nose and cheeks will have visible blood vessels like a blushing. Approximately 10% of the total population is affected by the Rosacea skin disease. Chamomile Compress: Chamomile tea contains many properties beneficial for the skin. You should wash your face with chamomile tea. Otherwise, you can prepare a chamomile tea at home. Pick up some dried chamomile flowers and add them in 3 cups of water and boil them for about 10 minutes. Strain the mixture and apply it on the affected skin using a cotton ball already soaked in this solution. Aloe Vera Gel: As we all know that aloe vera is generally adapted to treat the skin related problems and the results of this herb is amazing that everyone appreciates. You just have to mix 1 tsp of aloe vera gel, honey and 1 tbsp of ground liquorice together. After preparing the mixture, apply it on the affected areas of the skin then leave it for 15 minutes. Rinse with clean water. Creams that are suitable for reducing rosacea are based on green tea and tea tree oil and these are easily available at the herbal stores. Buy one of those creams and add apple cider vinegar in the quantity you take for applying. It will soothe your skin and control the redness. Turmeric: Prepare a paste of turmeric and directly apply to the rosacea areas. Massage with gentle hands after it gets dry. Rinse it off with cool water. Follow the remedy regularly. You have options to add 1 tbsp of oatmeal and 1 tbsp of yogurt in the turmeric paste. 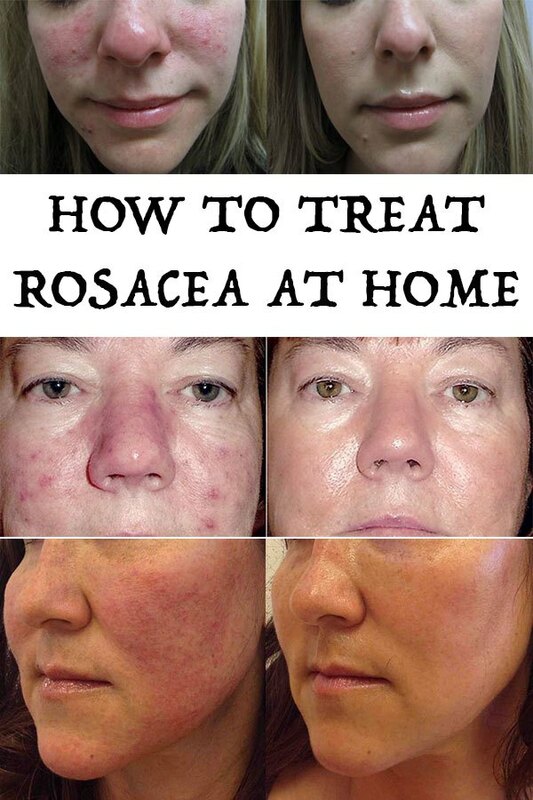 Another thing to control the rosacea is to concentrate on the proper health and diet. Eat foods that are rich in vitamin A, vitamin B-complex, vitamin C and zinc. These foods after reaching your body will help in fasten the healing process and strengthen the immune system. Besides these foods, you should also consume flaxseeds and fish oils due to having omega-3 fatty acids in a wide range. Alcohol and caffeine should completely avoid. If we talk about the physical activity then you are advised to avoid the strenuous exercise, prolonged sun exposure, emotional stress and anxiety. Will the tumeric stain the skin? Wash your face with Yogurt to remove tumeric stains. I've been using aloe vera gel and it really drys out my skin. What can I use to re-hydrate my skin afterwards? You'll have to use it along with other ingredients like olive oil, coconut oil, Vitamin E capsule or your regular moisturizer.